Microsoft’s newly released beta version of Windows Defender Offline, a rootkit-sniffing and Windows-rehabilitation tool, should be the latest addition to your bag of Windows-repair tricks. WDO should be able to catch a wide variety of nasties that evade detection by more traditional antivirus methods. 1. Windows won’t boot: You can boot your machine with a WDO CD or USB drive, and WDO will perform a detailed malware scan. 2. You suspect you have a rootkit: WDO can scan your system and remove many different kinds of rootkits. WDO is almost identical to an earlier product called Microsoft Standalone System Sweeper. Microsoft released the beta version of MSSS in May. (Susan Bradley’s July 28 Top Story talked about MSSS.) The size of the program hasn’t changed. The format of the signature files appears to be identical. The earlier product doesn’t mention Windows 8, but WDO most definitely does run on Win8 Developer Preview. As best I can tell, WDO uses the same signature files used by Microsoft Security Essentials (MSE). However, I know of one instance where a piece of malware was not caught by MSE but did trigger a WDO response. I have no idea why. 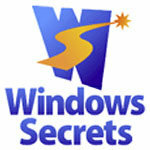 Windows Secrets Windows Defender, windows secrets. permalink.